It’s that time of the year again. Pack your picnic, grab a spot on the lawn and enjoy the beautiful sounds of the Orchestra in one of Melbourne’s most loved music venues. Celebrating 90 years in 2019, the Sidney Myer Free Concerts have been a Melbourne tradition since October 1929 when the MSO held its first free outdoor performance. It was 30 years later that the concerts moved to the Sidney Myer Music Bowl! It was in October 1929 that the MSO held its first free outdoor performance, intended to bring beautiful music to the people of Melbourne. Fritz Hart conducted the series of six performances, which were held in Alexandra Gardens on a temporary stage, and thousands of people were in attendance. ‘A musical ‘surprise’ packet has just been opened. Melbourne is to have open-air orchestral concerts. And they will be free. This innovation in orchestral music has been made possible by the generosity of Mr Sidney Myer’ – The Herald, 1929. In early 1930, another free orchestral concert series was held – this time at Melbourne’s Botanic Gardens. The program included popular works by Mozart, Schubert, Grainger, Strauss and Borodin, with the last performance of the series held on 8 April. Journalists estimated that over 100,000 people had attended the six concerts. Formerly known as the ‘Music for the People’ series, the Sidney Myer Free Concerts continued annually thanks to the support of Sidney Myer, even after his passing in 1934. 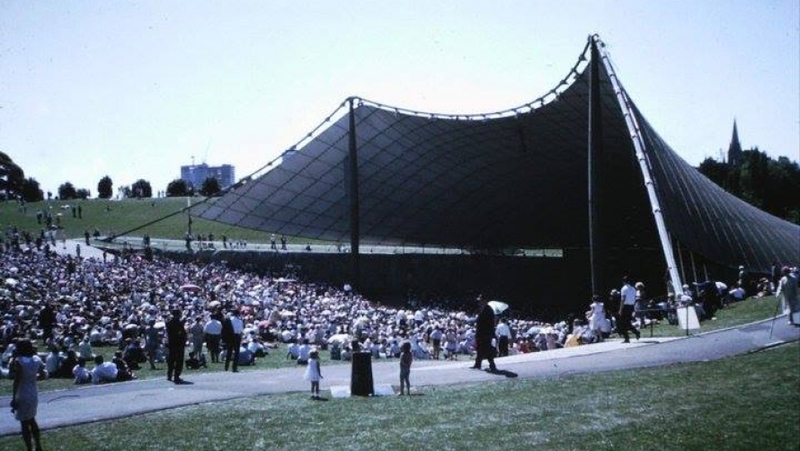 In 1959, after years of planning and construction, the Sidney Myer Music Bowl was officially opened and was declared as a gift to the people of Victoria. It has since provided a permanent home for MSO’s Sidney Myer Free Concerts. Do you have photos and memories from over the last 90 years that you’d like to share? Click here to share them with us!